February is Dental Health Month. It seems appropriate to spend some time on the subject after the sugary, candy filled day(s) that accompany Valentine's Day. Today, I am sharing some of my favorite Dental Themed Books for kids. These books are suitable for Preschool thru 2nd Grade. Open Wide: Tooth School Inside - a fun, silly book that peasants tooth facts in a way that the whole family will enjoy. The illustrations are detailed and quite humorous - you'll find yourself looking them over again and again and still seeing things you may have missed before. Show Me Your Smile! : A Visit to the Dentist (Dora the Explorer) - Follow Dora on her visit to the Dentist for a check-up. This book is great to read before a child's first visit to the dentist. It takes you through all the steps so children will know what to expect when it's their turn. The Tooth Booth (Dr. Seuss) - Explore teeth is whimsical Dr. Seuss style. Kids always enjoy seeing all the animals teeth and finding out facts about their own teeth. Plus, this book is great for those that are reading on their own. My Kindergartener and First Grader enjoy reading it on their own. The Berenstain Bears Visit the Dentist - We enjoy the Berenstain Bear books so this was a no-brainer once we were thinking of taking the Lil Divas to the dentist. There is some teasing by Brother Bear but as always the values and morals in these books wins out. Melvin, the Magnificent Molar? - A tooth named Melvin? Yes, and he's adorable and children love him. This was a cute book and the Lil Divas enjoyed seeing the Tooth Fairy and finding out what their molars are up to. Bear's Loose Tooth - Fans of Bear (from Bear Snores On, etc..) will delight in this story. Bear is concerned about his wobbly tooth and all his friends end up taking turns trying to pull it out. Ultimately Bear pops it out himself. This is a cute story for kids who are worried about losing their first teeth. Loose Tooth - A beginning reader book about that first wiggly tooth that young readers can read for themselves. With only a few words per page this a great confidence boosting reader that also explores those first wobbly teeth and the enthusiasm that comes with them. Young Cam Jansen and the Lost Tooth - A tooth mystery? Yes! This is great for your K to 2nd grade readers, especially if they are Cam Jansen fans. Annie's tooth falls out and disappears. It's up to Cam and her photogenic memory to help her find it. Fancy Nancy and the Too-Loose Tooth - When Nancy's friends loose their teeth at school they receive a special tooth holder necklace. Nancy really wants one of them but in order to get one her loose tooth has to fall out at school. So, when Nancy looses her tooth on her way to school, what can she do? Tell the truth or lie and finally get that necklace. Great conversation starter for your Fancy Nancy fans about doing the right thing. Preschoolers delight in having these read aloud while your K (with some help) and 1st graders can read these on their own. Junie B., First Grader: Toothless Wonder - If you have a K to 2nd grade Junie B. fan at home they will surely enjoy this one. Junie is the first child in her class to have a loose tooth and she is not happy. She has lots of concerns about how she will look and how the tooth fairy works. If you are averse to Junie's bad attitude and name calling then this book isn't for you. My daughter enjoys these books and we use any inappropriate behavior as a means of communicating what we expect our girls "not" to do. Make Way for Tooth Decay - An easy reader that teaches kids about bacteria and tooth decay and how they can prevent it. Bright and silly illustrations make this a humorous read for kids while still imparting useful information about tooth health and good dental hygiene practices. This is a great book for beginning readers in K (may require help with some words) thru 2nd grade (can read independently). 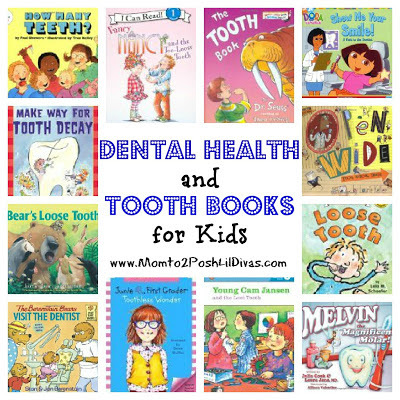 Do you have a favorite dental health or tooth themed book to share? I'd love to add more to our reading list. Thanks Megan! We had dental heath week at preschool & I was searching high and low for books so I thought a list would be useful to others. Such a great way to introduce the topic to kids - and also offer a story as an incentive for brushing :) Love the list! Books as incentives is a lovely idea - keep kids reading! I think these first visit to the dentist books make it so much easier for kids when they actually have to visit the dentist! Mia, my girls were so scared before their 1st visit. Books really helped us because it gave them an idea of what to expect and eliminated some of that mystery therefor reducing some of its scary factor. Really great blog keep it up. Sweet way to get kids on a healthy way of life. I really very appreciate you work. And want to thanks also for making us conscious for kids dental care. Wonderful blog - read it all the time - thanks for the book recommendations!